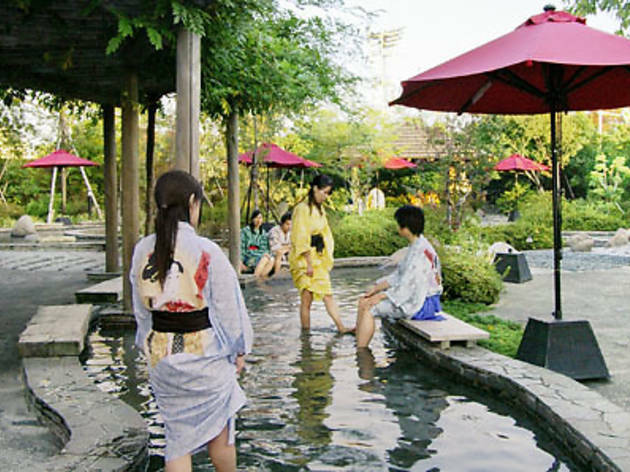 In addition to housing natural hot spring baths, open-air baths, saunas and more, this Edo era onsen theme park also does a line in festivals, fortune telling, places to drink and dine, shopping, and even overnight accommodation. 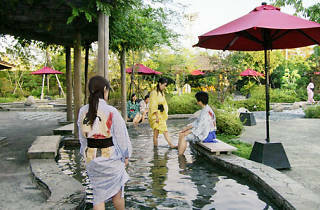 Oedo Onsen Monogatari houses six different type of baths, including one in which you can lie down (‘neyu’), a lukewarm bath ideal for summer (‘nuruyu’) and a special bath for dogs (‘Tsunayoshi Bath Tub’). The water is rich in sodium and chlorine ions, drawn from 1,400m underground, and the thermal baths here are thought to be effective in relieving nerve, muscle and joint pain. One special attraction can be found out in the Japanese garden – a 50m long foot bath, styled after an old ukiyo-e classic depicting the famed Edo-Kyoto highway. For visitors who enjoy strolling barefoot, there’s even a ‘Doctor Fish’ foot bath, where small fish eat away the dead skin cells and other rough nastinesses.